A team of researchers from UK and India have discovered a new snake species in northern Western Ghats recently. It is a burrowing snake of the Melanophidium genus and belongs to the Uropeltidae family of snakes. All species of this group are burrowers that live mostly underground. It is distinct from three other species of the similar genus. 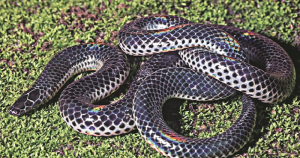 This new snake species has been named as ‘Melanophidium Khairei’ or ‘Khaire’s Black Shieldtail’ after Pune-based herpetologist (one who studies snakes) Neelimkumar Khaire to pay tribute to his contribution to the knowledge, appreciation and conservation of snakes in India. He is the legendary founder of Katraj Snake Park in Pune and the Indian Herpetological Society. The discovery is the result of meticulous efforts of scientists from Natural History Museum (NHM), London; National Centre for Biological Sciences (NCBS), Bangalore; the Indian Herpetological Society (IHS), Pune; and the Bombay Natural History Society (BNHS), since last 15 years (Researchers were studying the species since 2001 and confirmed the new species). First author Dr David Gower and Dr Mark Wilkinson from NHM, Ashok Captain of IHS/BNHS and Varad Giri a post doctoral fellow of NCBS constituted the team. The occurrence of new snake species was recorded around 144 years ago, however, at that time, researchers could not shed more light on the species. Giri said this would be the first such discovery after a span of 144 years. “This snake belongs to a family of Uropeltidae. It is a burrower and lives underground,” he said, addind that the species was discovered in the forest areas of Radhanagari in Kolhapur, Amboli in Sindhudurg and the adjoining forests in Goa. The research team’s finding was submitted to the sceitnfic journal Zootaxa and the paper was published recently. The new discovery came barely two days after another Indian team of researchers discovered a new snake genus and a species from Gujarat, which has been named Wallaceophis Gujaratenisis.